romances. Stay with me! That’s not as confusing as it may sound! Faith is an integral element of the story in all Christian romances. Characters live by the tenets of Christianity. Personal salvation, gained by accepting Jesus as savior, is emphasized. But characters tend to be nondenominational – they aren’t Baptist or Methodist or members of another specific faith group. Amish romances are an exception. They are very much about a distinct group of faith fellowships. The novels give readers insight into the culture, beliefs, and religious practices of the Amish characters. Faith governs lives so strongly that it almost becomes a character. Catholic romance takes a similar approach. Faith strongly influences characters and their lives. Readers get to learn about Catholic rituals and practices. There’s another distinguishing factor in the Christian and Amish romances I’ve read. They have a Protestant worldview. They’re wonderful books written by talented authors. But, in them, I’ve never seen – for example - an infant being baptized by a priest. In a Catholic romance, you could read about such an event. In fact, it’d be an important day of celebration for the family. Other things characters might do in a Catholic romance are attend Mass or say a rosary. Catholicism is an essential part of a believer’s being. It infuses all aspects of life, and that is reflected in characters in a Catholic romance. My hope is that the Persimmon Hollow series of historical romances will be enjoyed by people of all faiths as love stories that also provide insights into Catholicism as lived by regular people. So, there you have my perspective on the difference between Catholic and Christian romance. I’d love to hear what readers think. Do you agree with my observations? What do you think makes the books different? 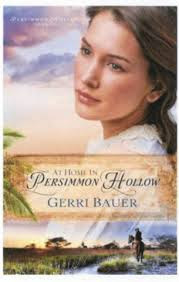 Gerri Bauer is the author of the Catholic historical romance At Home in Persimmon Hollow. Find her on Facebook at Gerri Bauer – Author, on Twitter @GerriBauer and on Pinterest at Gerri Bauer. About At Home in Persimmon Hollow: At Home in Persimmon Hollow is the first book in a series chronicling the world of Agnes Foster and the people of frontier-era Florida. In 1886, Agnes Foster is forced to leave the Catholic orphanage in New York where she grew up to start a new life as a teacher in Persimmon Hollow, Florida, a town she has only ever seen in a newspaper ad. With nothing but her strong Catholic faith to sustain her, she leaves behind the only home she’s ever known and the little girl she hopes to adopt, and encounters a wild and beautiful new landscape, and a town full of hardworking, faith-filled people. She also meets the difficult, yet handsome and hard-to-ignore Seth Taylor, a man whose heart has been hardened to God after a terrible loss. Just as Agnes starts to feel Persimmon Hollow could be a good home for her and her daughter, and that Seth could be her love, tragedy strikes in the form of a trio of evil men from both their pasts, intent on doing them more harm. Will their fragile new love survive? Will Seth return to his faith? Can Agnes finally escape her dark past and find a bright new future? Check out more information about the book here!